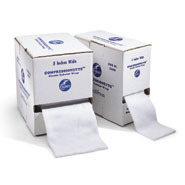 This versatile, elastic tubular wrap is an economical substitute for elastic wrap, cast covers and other supports. Holds cold/hot packs or bandages in place. Offers mild support and helps minimize swelling. Re-usable. Washable. 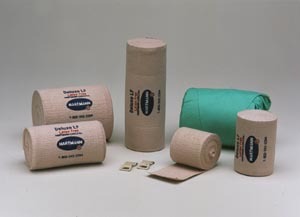 3" and 5"
Hartmann's high quality latex free elastic bandage. Hartmann-Conco's top quality elastic bandage Each latex free bandage is made with high quality woven yarns and can be laundered for re-use. Available 10pack. 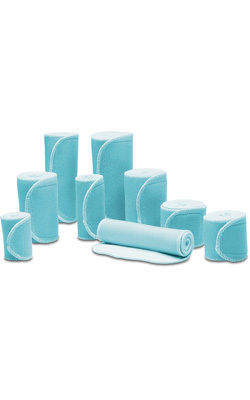 All-in-one foam dressing and cohesive bandage that helps players get back in the game quickly. available in sterile and non sterile. 2" or 4" wide. © Centennial Sales Sports Medicine All rights reserved.